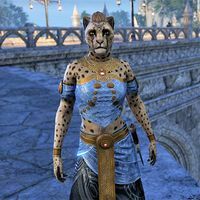 Hamirra is a Khajiit laborer who can be found in Alinor. She can be found wandering around the fountain outside the Alinor Royal Palace. "This one applauds the Proxy Queen. Putting her palace high above her city, where no idle petitioners can bother her." "This one thinks the people below are how High Elves must see everyone else. Can you care about something so small? Truly?" "There is nothing in this city Khajiit finds so fascinating as this fountain. How does the water get from the river to here?" This page was last modified on 28 September 2018, at 21:56.